Luminosity reverse swept Red Reserve, while Team Kaliber took down FaZe. Two months of intense Call of Duty action have led to this moment—the start of the CoD World League Pro League Stage One Playoffs. The eight best CWL Pro League teams have traveled to Columbus, Ohio to fight for their share of the $500,000 prize pool. The Stage One Playoffs kicked off today with several hard-fought matchups. Here are the results from the first round of the winners bracket at the CWL Pro League Stage One Playoffs. When these two teams squared off at CWL Birmingham last week, eUnited shockingly swept Rise Nation in pool play. And today’s matchup felt like deja vu, as eUnited once again beat the CWL Atlanta champions by the same scoreline. Preston “Prestinni” Sanderson led the charge in the respawn game modes, starting with his 30-kill performance in eUnited’s 250-206 win on Sainte Marie du Mont Hardpoint. Justin “SiLLY” Fargo-Palmer was extremely clutch on Sainte Marie du Mont Search and Destroy, and eUnited jumped out to a 2-0 lead with a 6-4 map victory. James “Clayster” Eubanks and crew closed out the series in convincing fashion with a 4-1 win on Flak Tower Capture the Flag. Prestinni once again dropped 30 kills to help eUnited pull off the upset and send Rise down to the losers bracket. The only European team in the Stage One Playoffs started out on fire. But Luminosity showed the resilience that helped them win CWL Birmingham by reverse sweeping Red Reserve. Red Reserve opened the series with a strong 250-133 win on Valkyrie Hardpoint behind Trei “Zer0” Morris’ 27/17 statline. The Europeans then took London Docks Search and Destroy 6-2 thanks to Rhys “Rated” Price’s 12-kill performance. Luminosity bounced back, however, and they gained momentum after a back-and-forth Ardennes Forest Capture the Flag, which they won 4-3. The CWL Birmingham champions then crushed Red Reserve 250-55 on London Docks Hardpoint, as JKap and Slacked both dropped 34 kills. Game five, USS Texas Search and Destroy, went down to the wire, but Luminosity clutched up in round 11 to take the 6-5 win and 3-2 series victory. Ian “Crimsix” Porter was a huge reason why OpTic dominated Team Envy. The Green Wall won both Hardpoint maps en route to a 3-1 victory over the Boys in Blue. 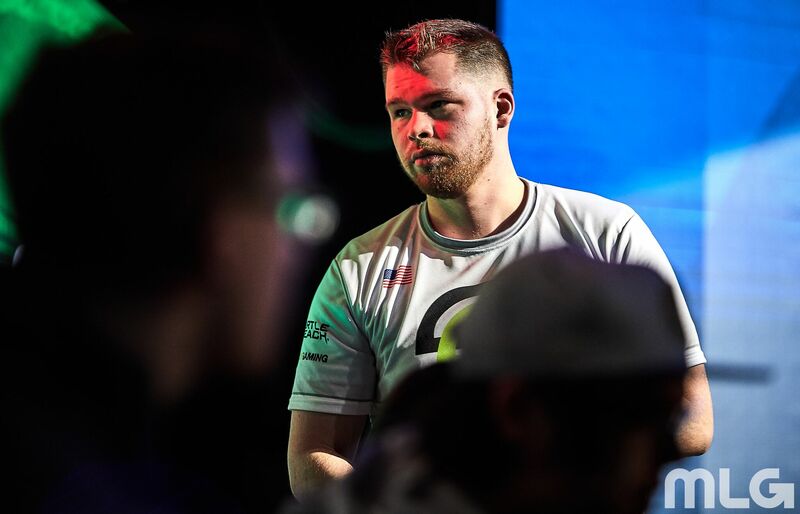 Crimsix went 39/23 as OpTic opened the series with a 250-104 win on London Docks Hardpoint. The Green Wall then absolutely dismantled Envy on London Docks Search and Destroy, taking map two 6-0 behind Crimsix’s 11/3 performance. Team Envy did take game three, London Docks Capture the Flag, 5-4 in overtime. But OpTic answered right back with a strong 250-151 win on Valkyrie Hardpoint—Seth “Scump” Abner went 27/17 in map four to lead the Green Wall to the 3-1 series victory. The final match on Friday night started with a crazy game of London Docks Hardpoint. Both teams dropped a ton of kills, but FaZe emerged victorious, 250-245, thanks to Tommy “ZooMaa” Paparratto’s 51/48 scoreline. But from that point on, Team Kaliber took control of the series. The two-time WWII champions won Sainte Marie du Mont Search and Destroy 6-4. And then, Lamar “Accuracy” Abedi took over the series. Team Kaliber dominated Ardennes Forest Capture the Flag 3-0, as Accuracy went 24/7. They then closed out the series with a 250-243 win on Gibraltar Hardpoint—and Accuracy once again led the lobby at 43/28, as Team Kaliber took the match 3-1. In the next round of the winners bracket, eUnited will face off against Luminosity, while OpTic will take on Team Kaliber. Rise, Red Reserve, Team Envy, and FaZe Clan will all try to begin their losers bracket run tomorrow, April 7 when the Stage One Playoffs resume at 1pm ET.